A beautifully written book which manages to succeed in helping to make faraway locations seem nearby, and to take the nearby/everyday or commonplace to different or faraway contexts, helping to bring fresh perspective on them in the process. 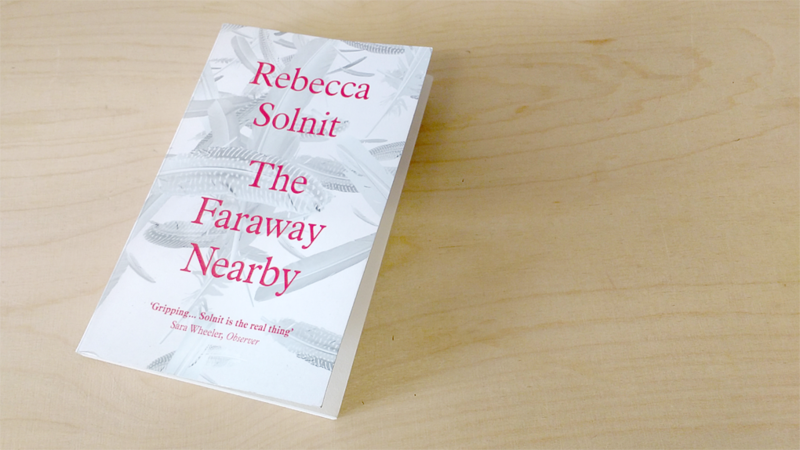 Solnit’s book is an elegant piece of memoir, almost of therapy. It takes what at times can appear to be a random stream of deep reflections, and weaves them amongst strands which take us deep into the territory of the craft of storytelling. Rather than just trying to unpick what makes a ‘good’ story, it uses these insights to heighten the experiences it introduces us to, making those feelings personal, and intense, and provoking us to reflect on our own story. It is difficult to not start looking for and making connections in your own life, just as she has in hers. The book is as good an example of psychogeography as you will find on the shelves, without ever trying to formalise such a definition for itself, or explore the concept – but place is important. I’ll end, by sharing the beginning of Solnit’s book, so you can decide for yourself if it’s a journey you want to pick up, and begin for yourself. I can thoroughly recommend it. It’s an engrossing book – at times, I was so effected by it, I forgot I was reading a book. And their is a delightful device running throughout the book of a pile of slowly rotting apricots from a tree in her mother’s garden, how she has to deal with them, what they mean to her, and what their legacy becomes. Beautiful, for a reader who has become obsessed with the sourdough revolution, and other baking for neighbours. This book helps you find it, and feel it.